Q: How long has SafeDinar.com been in business? A: We have been in business for more than 14 years and have tens of thousands of satisfied customers. For security reasons we do not offer a walk-in address. Q: Does SafeDinar.com sell their customers' information? Q: Do your customer service reps speak Spanish? / Hablas español? A: Yes, we speak Spanish, French and German. Please leave a message and request a call back. Sí, hablamos español. Por favor envíenos un correo electrónico a info@safedinar.com con un número de teléfono y hora de preferencia para devolverle la llamada. A: Please contact us with any question that you have: info@safedinar.com or call 877-723-3391. Q: Do you give investment advice? Q: What is the quality of the notes? A: For some currencies, we may sell both uncirculated (new, mint condition) and circulated (used) notes. You can find a description and examples of both here. Q: Where can I check the current exchange rate of the currency that you exchange? A: For Iraqi Dinar, you can check the most current, official exchange rate on our currency dashboard or at the Central Bank of Iraq's website at www.cbi.iq. For Vietnamese Dong, you can check the most current, official exchange rate at the State Bank of Vietnam's website at http://www.sbv.gov.vn/. Q: Do you buy back the currency that you sell? A: Yes, SafeDinar.com has a buyback program. Please see the Sell Currency section of our website, review the "Selling Currency" section of the FAQ's or call 877-723-3391 for details. Q: Where can I exchange the currency I purchase? A: Currently, there are very limited options for exchanging exotic currencies. This is something that you should take into account before you make a purchase. Q: Can I return or exchange the foreign currency I purchase? A: All sales are final - we do not accept exchanges or give refunds. Q: Are you registered with the US Treasury? A: Yes. You may review a copy of our registration document. Alternately you may visit the US government website for Money Services Business, www.msb.gov. Select the state of Massachusetts, you will be prompted to download an Excel file, our listings are records 12 and 13. We are a registered MSB (Money Services Business). Q: What is the significance of the pictures on the notes? Front - Gully Ali Beg and its 800m waterfall. The 10km gully passes between Mount Kork and Mount Nwathnin, some 60km away from Shaqlawa. Back - The second century desert fortress of Al-Ukhether, Hejira. Front - Abu Ali Hasan Ibn al-Haitham (known as Alhazen to medieval scholars in the West), born Basrah in 965 CE. His most important work - although he wrote some 200 books - is held to be a seven volume series on optics Kitab al-Manazir, in which he gives the first correct explanation of vision, showing that light is reflected from an object into the eye. He is said to have ‘invented’ the camera obscura. Also, an eminent physicist and mathematician he developed analytical geometry by establishing linkage between algebra and geometry. Alhazen’s work was translated into Latin, and greatly influenced European scientific thought. Back - Hadba Minaret, at the Great Nurid Mosque, Mosul, built 1172 CE by Nurridin Zangi, the then Turkish ruler. The 59m-high minaret leans 8 feet off the perpendicular. That is how it earned its Arabic name Al-Hadba (‘the humped’). Front - Kurdish farmer holding sheaf of wheat. Tractor in background. Back - King Hammurabi, best known for writing the first code of law in human history. Hammurabi founded the First Dynasty of Babylon in 1700 BCE- the beginning of a prosperous era for the region. Front - traditional symbols to reflect Iraq’s diverse heritage including a water wheel on the Euphrates river, palm trees, flying birds and the Gali Ali Beg waterfall in Kurdistan. Back - Fisherman poles a canoe through a marsh surrounded by indigenous animals with the Great Mosque of Samarra in the background. Q: Why do you ask for a copy of a driver's license or other information on certain orders? A: As a registered MSB (Money Services Bureau) we are given guidelines from the US Treasury Department regarding transactions where secured funds are involved (cashier's checks or money orders). The treasury regards these transactions as cash transactions. These rules were set up to identify people who might be laundering money. It is known as the "know your customer" rule outlined under the Patriot Act Compliance guidelines. The information that we collect is not shared with anyone, but must be available in the event that we are audited. We use the guidelines given to us to determine when a driver's license is required. We are not at liberty to discuss what those guidelines are. Any further questions should be forwarded to the main office for further explanation. Please note that the fax of the driver's license must be legible before we will ship the order. 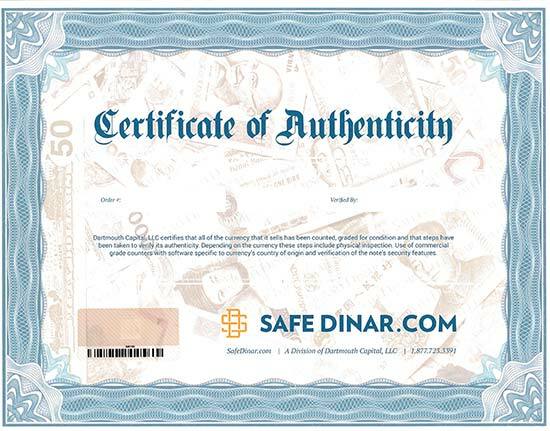 In an effort to save time we suggest the customer enlarge the license image before faxing, or use our preferred method of scanning and e-mailing to info@safedinar.com. You are not required to set up an account in order to buy currency from us; however, if you order again, you will have to reenter all of your information. You may also be asked to supply your verification information again. Q: I have ordered from you before, but I don't remember setting up an account. How can I retrieve my password? A: You will need the email address used on your last order. Submit that email address here, and a temporary password will be issued to you. Once you sign into your account, you will be able to view and print your order history, and update your personal/contact information. Q: I have never ordered with an e-mail address. Do I have an account? A: No, if you have never provided us with an email address, you would not have an account. If you now have an email address you would like to use, a new account can be set up for you. Q: Are you registered with FinCEN? A: Yes. You may review a copy of our registration document. You can confirm it by visiting FinCEN's website as well. Q: Can you provide a certificate of authenticity? A: For security reasons we have incorporated our Certificate of Authenticity into the packing slip that you receive with every order. The packing slip now includes a unique, bar coded hologram. You will find all of the terms and conditions of your transactions on the back of the document.